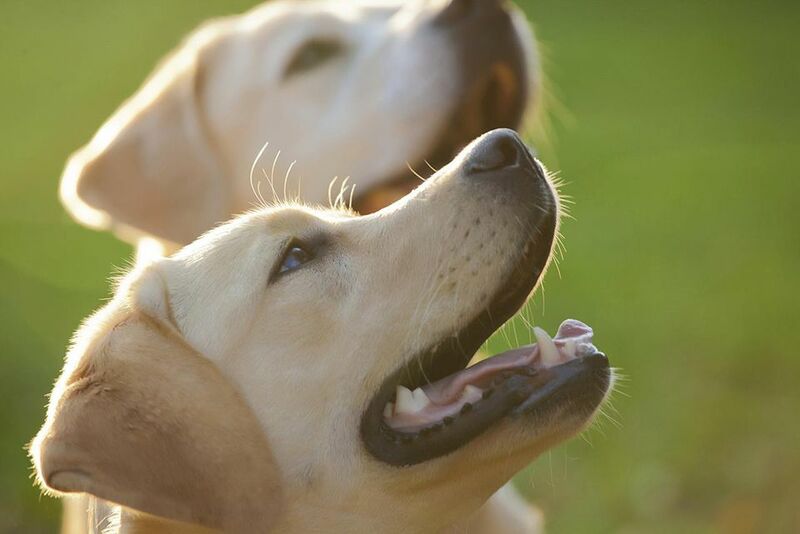 Labrador retrievers, or “Labs,” are one of the most popular dog breeds in the United States. They are medium to large-sized dogs with sturdy, athletic builds. Labs are known for their intelligence, fine character, and good temperament. Though bred to be hunting dogs, these qualities also make them excellent companions. In addition to their sporting abilities, Labs make excellent service dogs. They are often trained to become guide dogs for the blind, handicapped assistance dogs, and therapy dogs. You will also see them employed as drug and explosive detection dogs, water rescue dogs, and search and rescue dogs. Labrador retrievers, despite their name, actually originated in Newfoundland. The breed was developed from the St. John’s water dog, which is a combination of Newfoundlands and small water dogs. Meanwhile, the Newfoundland came from Labrador, so the names of the two dogs are reversed geographically. In the early 19th century, the Duke of Malmesbury developed an interest in the breed and brought them to England to serve as gun dogs in retrieving waterfowl during hunts. The breed died out in Newfoundland due to a dog tax meant to protect sheep and English rabies quarantine laws. But the English were able to preserve and develop the breed standards still known and loved today. The breed was recognized by the American Kennel Club in 1917. They have smooth, water-resistant coats and otter-like tails that make them excellent water dogs. Because of the breed's short coat, little more than basic grooming is required. The coat is low-care in that it sheds most debris naturally, so you do not have to clean your dog after a walk. However, because Labs are heavy shedders, routine weekly brushing is beneficial to ensure the natural oils are distributed and some of the loose hair is removed. You are going to need a good vacuum cleaner for your home and expect that all of your clothing will carry at least a few doggy hairs. A Labrador retriever is likely to need a bath about every two months. If your dog is getting plenty of exercise, it may wear its nails down naturally. But if you hear clicking on a hard floor, be sure to trim its nails. It may need this done once or twice a month. Attention to dental hygiene is important for health and longevity. It is good to brush your dog's teeth daily, or at least two to three times per week. Check ears weekly for any signs of infection, which are common for dogs who get their ears wet from swimming. Labs are best suited to homes where they can get plenty of exercise, attention, and training. Labs are high energy and not well-suited to apartment living. You will need to take your dog for 30-minute walks and visits to a dog park where he can run off its energy. If you have a fenced yard, you can play with your dog there. Be aware that they can be escape artists and make sure your dog wears tags or is chipped. Bad behavior may develop if a Labrador retriever is left alone most of the day and not given enough exercise. Labrador retrievers love retrieving things and they tend to like to carry things around in their mouths. Provide durable chew toys and balls for them to mouth. Providing training at an early age can ensure your Labrador retriever behaves well on a leash and follows directions. This will ensure you have a good canine citizen and not a rowdy, unruly dog. Socialization will also help your dog learn to be around visitors, dogs, and other pets without being fearful or defensive. As true family dogs, Labs usually get along well with children and are known to be incredibly loyal, loving, and active. However, young children should always be supervised around a dog until they learn how to behave around a pet. Once your children are old enough to respect a dog, a Labrador retriever is a good choice for a busy household. Labrador retrievers also do well in multi-pet households, especially if socialized to other dogs and cats. Always monitor any new additions to ensure all of the pets are behaving appropriately. Feed your Labrador retriever two meals a day of 1.25 to 1.5 cups of dry dog food. The amount will vary depending on your dog's size and activity level. Nutrition needs change over a dog's lifespan and you should discuss this with your veterinarian at each visit. Be sure to provide fresh, clean water. It is common for Labrador retrievers to put on weight and become obese, in part because they love food and do not self-regulate well. It is up to you to portion out food so your dog does not overeat. If you notice your dog has gained weight, discuss with your veterinarian how you should modify a feeding schedule, type of food, amount of food, and exercise. Obesity can shorten your dog's lifespan. If you have determined that a Labrador retriever is the right fit for your household and that you can commit to the rigorous activity that this breed needs, then you should consider looking at the Labrador Retriever Club as your prime resource for where you should look for a dog. The Labrador Retriever Club: National parent organization for the breed in the United States, recognized by the American Kennel Club. Before you decide whether a Labrador retriever is the right dog for you, be sure to do plenty of research. Talk to other Labrador retriever owners, reputable breeders, and rescue groups to learn more. Explore a whole world of potential dog breeds. With a little research, you can find the right one to bring home.